I haven’t picked up my copy of Grand Theft Auto IV yet (today it will be mine! ), but events could very well play out like the above. it’s mine. unboxing it now. impressions soon. The things they let kids play with today… Very funny! I love the contrasting reactions on each of your faces in the last frame! Rock on! Good work, ‘Bot! Parents all over the Valley will be buying this for their kids. And they will eventually become my clients… A therapist’s work is never done! Good lord man, get some sleep!! Now you best get busy beating hookers up with baseball bats. Made me laugh out loud!!!!! congrats Jeff!! i’m the golden child, i spent the whole day with M & D. when can i borrow the gun? janonymous, glad it cracked you up even if it got a bit messy. funnyshaffer, thanks, man. 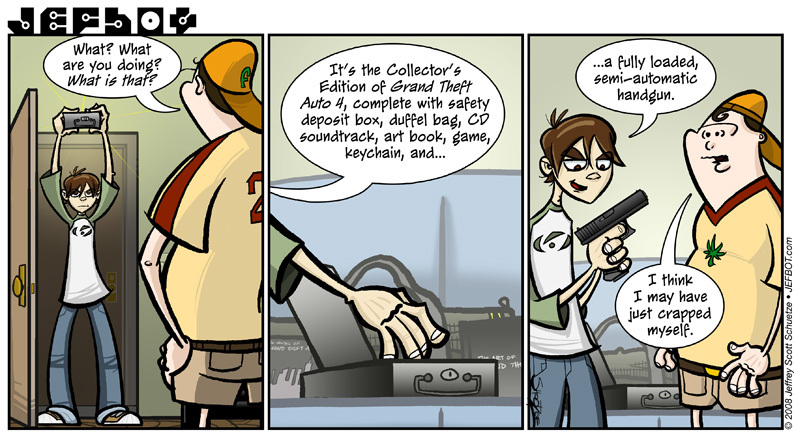 i’m just glad they didn’t make gta iv for the wii – all that waggling and flailing would’ve been a recipe for disaster. thanks, ambie! would be interesting if there was an in-game therapist while you’re playing, looking over your shoulder and suggesting other ways of solving problems other than with guns. probably wouldn’t be very fun, but could be hilarious for a bit. john, i can sleep when the hookers are dead. i kid, i kid! mary, woo-hoo! that made my day. unfavorite, what treachery! i will win their love back, you’ll see. even if i have to bring the gun out… again, i kid! Those eyes are evil, I say! Pure eeeevill! Voted for you at joystiq. Whoohoo ‘bot! How timely. My friend just said yesterday that this game is the greatest game, ever. I guess it is. mac, i haven’t played much, yet, but it’s really good so far. your friend just may be right. natalie, ssbb is another game i haven’t gotten to play much, lately so i haven’t seen the giant puppy yet. i take it it’s good?